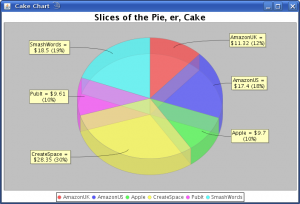 Software to help you manage your Magic Bakery*, submission** and sales tracking tools for traditional, ePub and POD. If you're like most small-press publishers or independent author-publishers in the field of ebook sales, you've already discovered the headaches of dealing with all the different formats of royalty statements from Amazon Kindle, B&N PubIt, CreateSpace, Smashwords, and the many other outlets for your work. 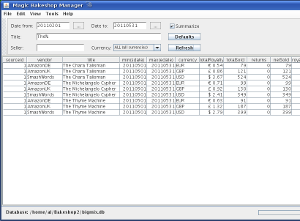 MagicBakeshop simplifies the process, importing the various retail report files and aggregating the data into a single database. The built-in analysis tools let you run queries and reports to see which of your titles are most popular, which outlets are performing best at selling your work, and how much money you're making in royalties. The software was designed by an engineer with over twenty years experience in the software industry who is also a professional fiction writer and indie publisher. 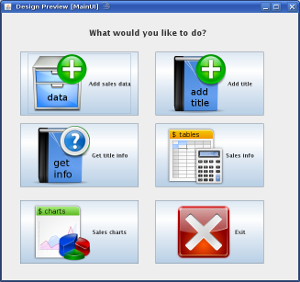 It is in active development with the Alpha released to testing in June, 2011. Easy import of royalty report files from Amazon KDP, PubIt, CreateSpace, Apple iBookstore, All Romance eBooks, Smashwords, and others into a unified database. Export data to Excel and other applications. 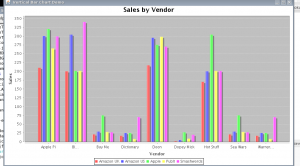 Pushbutton queries for top selling titles (by sales volume or revenue), revenue or volume by title, optionally grouped by sales outlet or country (currency). Ad-hoc database queries for expert users. More to come as experience and demand dictate. The above is considered the minimum feature set for initial release. With short fiction in particular, submitting and selling stories to traditional markets before indie publishing them as ebooks is a great way to increase your visibility and your writing income. Since MagicBakeshop sales tracking software already tracks data by title, it's a logical step to tracking submissions and traditional sales. The submission tracking will be, when complete, available both as a standalone program for those who don't want or need the indie sales tracking, and as part of the overall tracking suite. Check back for further developments. See the support blog for details. © Magic Bakeshop Software 2011.